300 gm paneer, chopped into tiny cubes. Heat butter/ oil. Roast finely chopped onion and garlic, till onion turns brownish. Add finely chopped green chilles, garam masala, chilli powder and turmeric powder and roast for a couple of minutes. Add tomatoes and saute till they are completely cooked. Add capsicum and saute for a few minutes till they become soft. 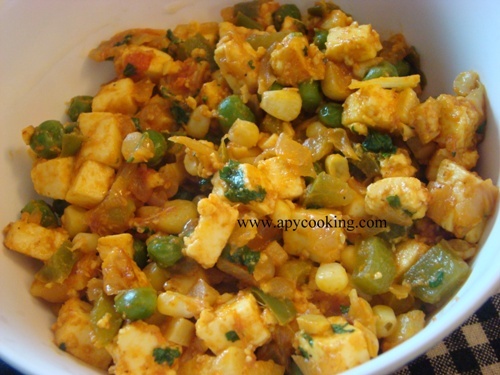 Add paneer, green peas, corn and tomato ketchup and roast for sometime. Garnish with coriander leaves. Combine 1/2 cup warm water with sugar. Add yeast, mix gently and set aside for 10 minutes till yeast becomes frothy. In a large bowl combine the flours, salt, water and ghee/oil. Add the yeast mixture and knead into a dough. (Add more flour or water as needed). Transfer the dough into a well oiled bowl, turning the dough in the bowl so that it is coated with oil. Cover with a plastic wrap and set aside for one and half hours. The dough will double in size. Punch the dough to remove air. 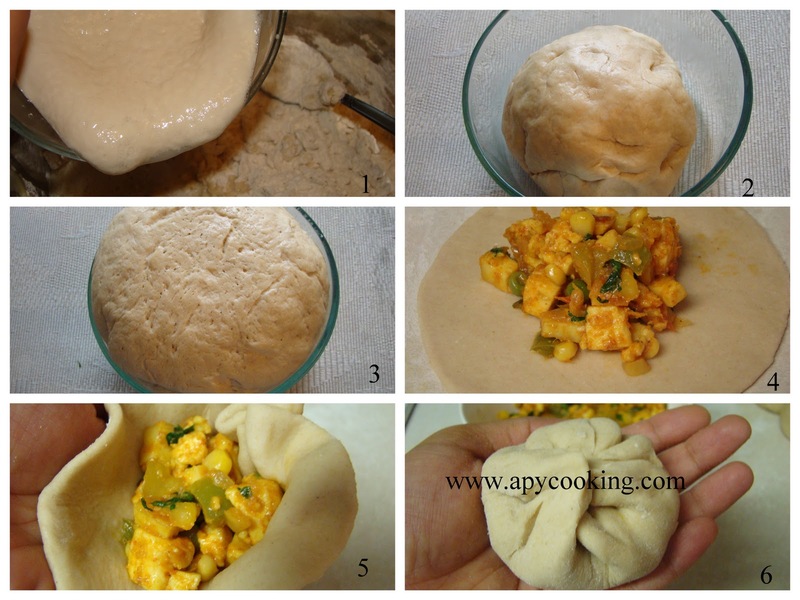 Divide the dough into 12 equal portions and roll each one into a ball. On a cutting board or a clean counter top, roll each ball into a circle, 4 to 5 inches in diameter. Place the filling (about 1 and 1/2 tbsp) in the center. Pull the sides so that they join together in the centre. Press the sides, flatten with your palm and shape into a round. Place the ball seam side down on a baking tray, lined with foil. Brush the top with milk, butter or egg wash and sprinkle sesame seeds on top. Cover lightly and set aside for about half an hour. The dough will rise again. Preheat the oven to 375ºF. Bake for 18 to 22 minutes (mine took 21 minutes) till the bun turns slightly brown in colour. When my husband came home from office this evening I welcomed him with these hot buns straight from the oven. The look on his face was priceless :)!! I could almost smell the aroma right off the screen! Got me drooling even after a heavy dinner. Hope you took a pic of your husband's expression as well :). Great job Aparna!! Very nice looking buns and surely a filling one. I made something quite similar and have posted it yesterday. 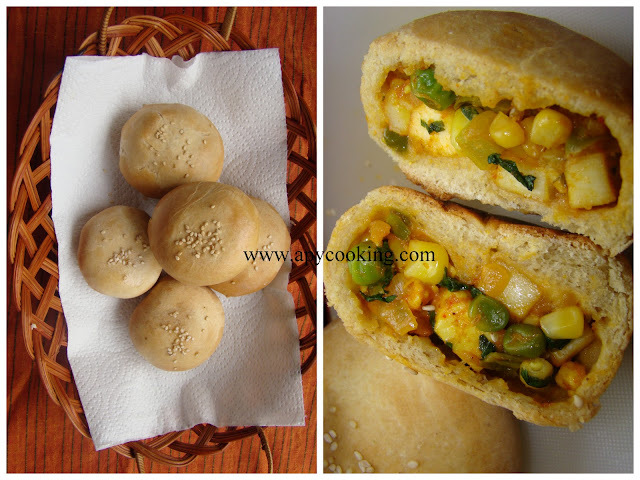 Woww great looking and delicious buns, i can have them rite now..
Paneer Bun looks so fulfilling and delicious. You have prepared a great recipe. Congrats! Fabulous!! Brings back some wonderful memories of stuffed buns I used to eat in Bangalore. Looks delicious P! 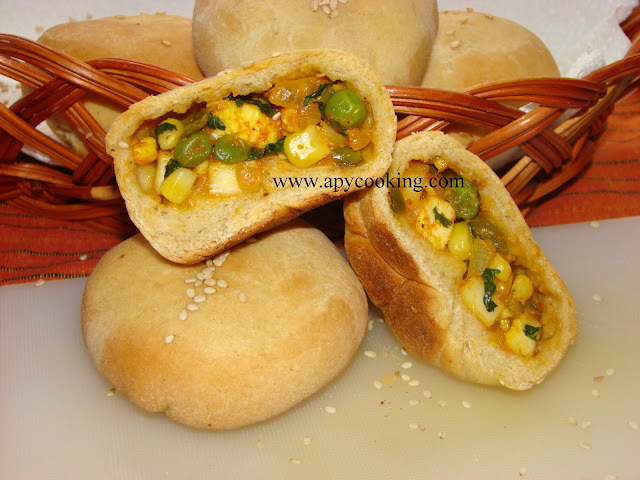 Paneer stuffed buns looks delicious. What a unique recipe and a flavourful one at that! These look exquisite. wow ! perfect ! what a treat ! 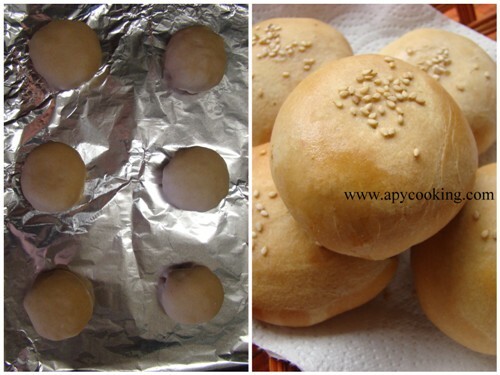 The buns look cute and the filling makes them delicious! Hi, That looks super... Perfectly baked. First time here and I enjoyed browsing through your lovely blog and recipes... Great going... Glad to follow u..
Hey Aparna.. love your idea of stuffing bread. Looks delicious! Looks perfect and amazing pics !!! First time here...u have wonderful space and nice collection of dishes..Glad to follow u !!! i prepared this.it came out good thank you.